The World Federation of Exchanges has presented recommendations to its member exchanges on how to implement their sustainability policies, the culmination of a year-long project by its Sustainability Working Group. The guidance, presented at the WFE’s General Assembly in Doha on October 20, is designed to be implemented by member exchanges on a voluntary basis. The WFE Guidance & Recommendations identifies material ESG metrics which exchanges can incorporate into disclosure guidance to companies listed on their markets. Specifically, the enhanced guidance highlights 34 key performance indicators, including energy consumption, water management, CEO pay ratio, gender diversity, human rights, child and forced labour, temporary worker rate, corruption and anti-bribery, tax transparency in addition to other corporate policies. 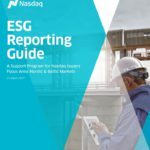 It also offers practical advice on how to roll-out enhanced sustainability disclosure. In addition, for those exchanges signed up to the UN’s Sustainable Stock Exchanges initiative, the adoption of the WFE guidance is a way to meet their SSE commitments. Policy-makers, regulators and investors around the world have become increasingly focused on the issue of sustainability. Bank of England Governor Mark Carney recently drew attention to climate change as a potential source of financial instability and investors are increasingly asking for more disclosure of companies’ ESG policies and practices. The EU has also recently announced plans to require publication of non-financial information by companies. The topic is likely to gather momentum following the recently announced UN Sustainable Development Goals and in light of the looming climate change negotiations in Paris. Exchanges – recognizing the role they play in ensuring transparent and resilient markets – continue to seek meaningful yet practical ways in which to play their part in this area. The Sustainability Working Group is the largest working group within the WFE. It was established in 2014 and has a mandate to disseminate and foster best practice among its member exchanges on sustainability. Other recent WFE SWG projects have included a survey of exchanges’ best practice on sustainability around the world and the group also provided input into the UN’s SSE Model Guidance which was published in September. “Exchanges operate orderly markets, seek to foster investor trust and invest in promoting good corporate governance standards. As an industry, exchanges are seeking to connect the dots for investors, companies, regulators and the wider community,” WFE CEO Nandini Sukumar said. “The guidance provides exchanges which want it with practical advice on how to take their sustainability policies to the next level and will help them meet the international sustainability benchmarks to which they are committed,” she added. “The guidance is flexible, effective and practical,” said Evan Harvey, director of corporate responsibility at Nasdaq and chairman of the WFE’s SWG. Over 44,000 companies – representing a total market capitalisation of US $64 trillion, trading value of US $76 trillion and equivalent to more than 75% of global GDP – list on WFE member exchanges.